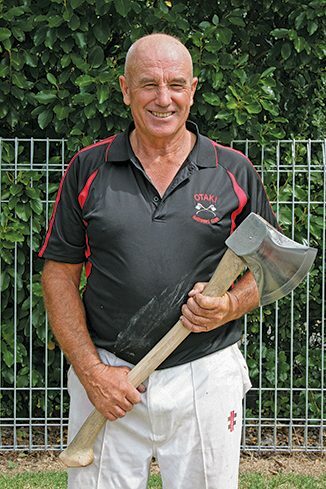 When it comes to woodchopping and contracting, the name Rasmussen is pretty well-known in Otaki. Pip Devonshire Graham’s grandparents came from Denmark in the 1880s, settling in Palmerston North. Dad & mum moved to Otaki after World War II, living in Waitohu Valley road. Graham has four brothers and a sister; they’re all nearby except Brian, who’s a fencing contractor in the Far North.Pip DevonshireGraham was born in the Otaki Cottage Hospital in Haruatai Park in 1950. He went to school in Otaki, and has been here all his life. He played rugby for 25 years, turning out for Rahui on Saturdays as prop or no. 8, then on Sundays he’d play League. Tough fullahs, these Rasmussens.Pip Devonshire Graham married Pauline when he was 25. They have two children. Carla works in Oz’s bakery, while Hayden works with ‘Ras’ and uncle Laurie at Rasmac Contractors. A drainlayer by trade, Ras and his team will take on just about anything that involves machinery. 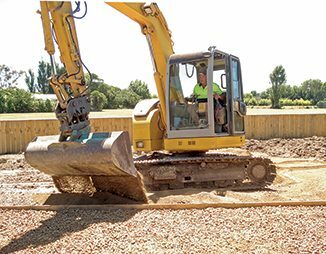 They have dozers, diggers, trucks and rollers, and will work anywhere in the lower North Island. Most of their work is by word of mouth. It’s the quality of their work that’s hard to fault. ‘Ras is a bit of an artist’ was my builder’s laconic comment. Watching a man guiding a big digger with the skill and dexterity of a conductor directing an orchestra is not an everyday occurrence, but to see a pile of dirt manoeuvred into an orderly shape is a joy to behold. Ras is the man.Pip Devonshire When not moving mountains, you can find Ras on a Friday evening watching stock cars crashing and bashing.Pip Devonshire Then at the weekends you’ll find him wielding an axe.Pip Devonshire Graham Rasmussen was champion of New Zealand at the age of 50 and with his son Hayden double hand sawing champion. 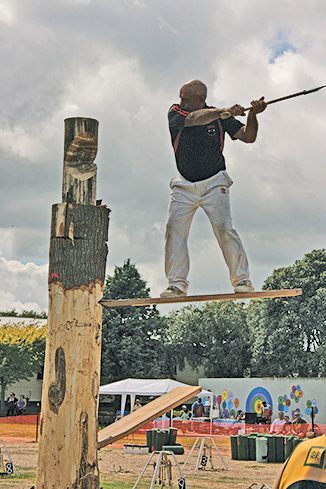 Now he’s in the NZ veterans team and still chopping and sawing. In the Summer, Graham is off on the A&P show circuit. Gisborne in October, followed by Hawkes Bay, Carterton, Palmerston, Wanganui, Hawera, Stratford, Tokoroa and Inglewood at Christmas. Then for a bit of variety Graham and the team will compete at the bottom of the South Island. ‘Lots of little A&P shows, good people’, he says.Pip Devonshire It’s a sport for boys to seventy year olds, so he’s got a few more years to go….